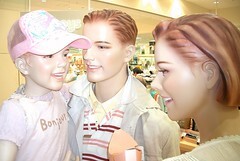 At the entrance to a Japanese mall, a group of Western looking mannequins, with French and English writing on their clothes, showing the Japanese "how we want to be". With images like this, it is not surprising that Japanese want to undergo cosmetic surgery to make their noses more pointy. At the same time, there may be more to this practice than meets the eye. I think that if the mannequins were Japanese then they would look too lifelike, too scary, since the Japanese identify more with the body.